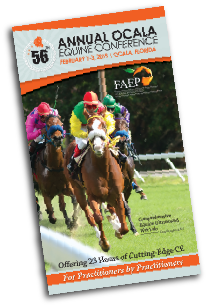 Get the most from your 56th Annual Ocala Equine Conference experience! A special feature for our attendees - utilize our itinerary builder to create an itinerary of lectures you would like to attend. "My Ocala Plan" enables you to build a list from your preferred conference programs. Search or browse for conference programs using the options at left. Note sessions of interest by clicking on the star and add to "My Itinerary". You can access your itinerary at any time by selecting "My OEC Plan" at left. As you continue to add or remove programs, your itinerary will be updated.